Welcome to Mac’s Sushi,where we prepare and distribute delicious, authentic, and fresh ready-to-eat sushi and rolls. Quality and incredible flavour is of the utmost importance. We use only premium ingredients in our food, and never compromise on quality or freshness. Catering services are also available. Parties, birthdays, business meetings or corporate functions — Mac’s Sushi can do them all. Grab a quick and healthy lunch on the go, or enjoy a delicious dinner after a busy workday at one of our kiosk or inline stores. 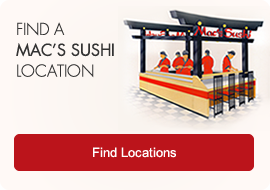 Find the Mac’s Sushi location nearest you! For More Authentic Sushi, Go to Japan! When you dine at Mac’s Sushi, you can be sure that you’re always getting 100% authentic sushi, made in the traditional way. This is because Mac’s Sushi employs only authentic, highly experienced chefs who are highly skilled in their art. All of our apprentice chefs must first train and work under the Master Chefs to ensure that Mac’s quality and standards are carried through to all our products. Once you try the authentic sushi from Mac’s Sushi, you’ll never settle for anything less. Our sushi is made fresh daily and never leftover from the previous day. Not all sushi shops are as dedicated to freshness as we are at Mac’s Sushi. In fact, we’ll let you in on a little secret. Each evening before we close nightly, any sushi that has not been sold over the course of the day is discounted to our customers. 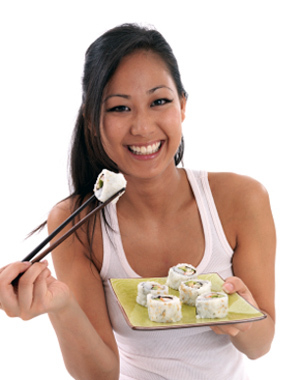 The only thing better than fresh, mouthwatering, delicious sushi, is paying less for it! In addition to tasting the difference, you can be sure that each time you eat at Mac’s Sushi, you’re eating delicious, same-day sushi of the freshest quality! We provide authentic sushi that wakes up your taste buds and makes them say “WOW!” It’s all about spectacular food with great friends — there isn’t anything better than that. 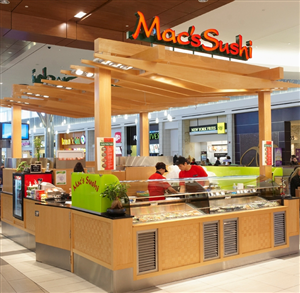 Click here to find the Mac’s Sushi location nearest you.